For many people, when they think of healers it conjures up images of wise men and women or witch doctors from afar performing magical rites and spells. However healing therapies have become a popular way for people to relax and bring themselves back into a state of harmony. I can quite understand the scepticism of many, for I was one of those who remained sceptical; until I found I needed healing to feel healthy and well. My first experience of energy healing began with Reiki, a Japanese form of healing founded by Dr Mikao Usui. Reiki is all about using the energy from the universe to heal others and was founded on the belief that the world contains a Life Force. The Chinese call this ‘Chi’ and for many of you who do yoga, you may hear of your Yogi’s talking about ‘Prana’ which is the Life Force. Reiki works on the principle that our bodies have energy pathways, along our physical anatomy, and if these channels become blocked, our body reacts by making us feeling unwell. Think of the energy flow as another system along with the circulatory and lymph system. A simple explanation, I know, and I could go into more detail, but if we think about it, the very notion of us ‘lacking energy’ comes from these principal ideas founded thousands of years ago. Chinese medicine including acupuncture works on this idea that everything is energy, so why not take a holistic approach to health and medicine? Reiki is either a hands off or hands on treatment and is conducted with the client lying or sitting comfortably and fully clothed. 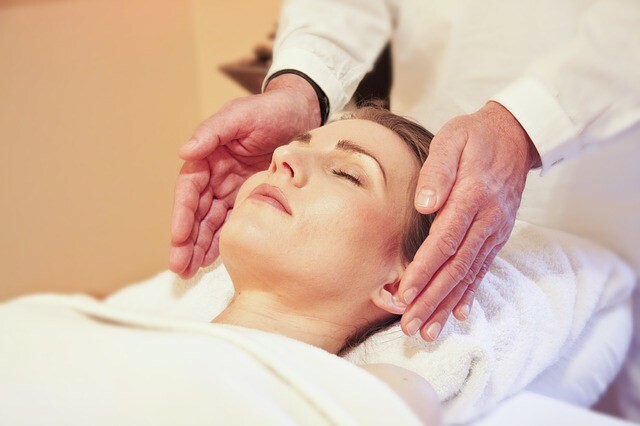 The feelings and effects of Reiki will differ between people, however, Reiki energy is felt more than other types of healing. It is scientifically proven to electricity and magnetism. Your therapist will scan over your body and you may feel warmth, tingling, a pins and needle effect or even as though they are touching you. The therapist’s hands are guided to areas of the body which are in need of healing energy. This is anything from earlier breaks or fractures, to other conditions you may have suffered with in the past or present. It is important to stay relaxed and remember, your therapist is not a Doctor, and they cannot diagnose problems. But they can tell you where you need awareness within your body. Often, the energy will flow where you have depleted energy, building up the source to make you feel balanced. The treatment itself is relaxing and refreshing. The effects start to show a few days after the treatment, as you may feel drowsy straight away after the experience. Expect underlying colds to come out, but do not see this as negative; it is your body releasing unwanted toxins and illness. My curiosity about the treatments led me to train with a Reiki Master meaning I have been attuned to the Reiki energy level. This insight has allowed my scepticism to stop and my belief in a holistic approach to wellness has furthered. My scepticism first went away when I scanned my hands over my model, not knowing anything about her medical history or ailments. The draw of the energy is like a magnet and straight away went to her left arm. I had to take a few minutes before asking her if she had damaged her arm in any way at all, thinking I would be totally wrong. Yet to my wonder she had indeed had a break. From then on after practicing on friends and family, I have always trusted the magnetic pull I get from working with Reiki. There are many practitioners out there who do healing and genuine Reiki therapists will always have a lineage going back to the founder Dr Usui. It is important that you ask to see this lineage as proof of qualification, as unfortunately there are courses out there which deceive people into thinking they are Reiki trained. All practitioners need to be trained by a Reiki Master, and again I urge you to check for their lineage. To practice, a therapist needs to have Level Two standards and the relevant insurance. It is a myth to say that energy healing is phony, with no effects at all, but you have to open up to the notion that it is working. I am seeing the popularity for holistic therapies returning, with many prestigious spas and salons offering such treatments. Modern medicine is a wonderful thing, yet we always find that traditional holistic practices still persist, with many a truth behind it. In an age of new enlightenment the view that holistic practices are a placebo effect, is slowly dying out, with people have an open-mindedness to try new therapies. It is here where I like to stress that medical concerns should always be seen by a general practitioner, and remember honest Reiki therapists will never diagnose or make promises to you. Yet I hope even if it is to get back to ones self, to relax or to aid your well- being, that many more people will treat energy healing with an open mind and allow yourselves to treat the whole body to support your health and your inner Chi. “Just for today do not worry. Be kind to every living thing”.